Ryde Airport was situated to the east of the road to Brading (A3055) on 823 acres purchased from Barnsley Farm by Wight Aviation Ltd. The airport opened on 27th June 1932 with, initially, routes to Portsmouth, Shoreham and Shanklin (Apse Heath) using a grass runway. Later routes were added to the Channel Islands and London Gatwick. The airfield was closed and obstructed during WW2. 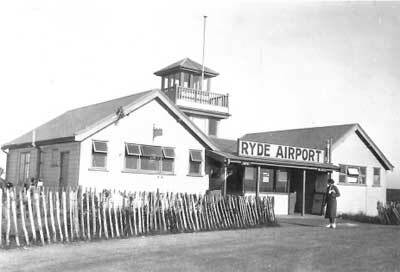 After the war, the British government applied restrictions on privately owned scheduled air services to protect the monopoly of the state owned airlines which resulted in Ryde Airport remaining closed immediately after peace. It reopened in May 1950 for both private flying and charter operations but did not last long - flying ceased in the late 1950's and the site was sold off. The site remained largely unused for a number of years although a Island Industrial Fair was held there 1966/67'ish, as well as a national rally of home-made hovercraft. The 1970's saw the control tower building as the La Babalu nightclub and, further from the road, there was a large go-cart track. Today no sign of the airport remains, and the site is now occupied by a leisure centre and supermarket.